The sequel to Real Racing 2 has been released by EA and Firemonkey, and is currently available for free on the Google Play Store and the Apple App store. 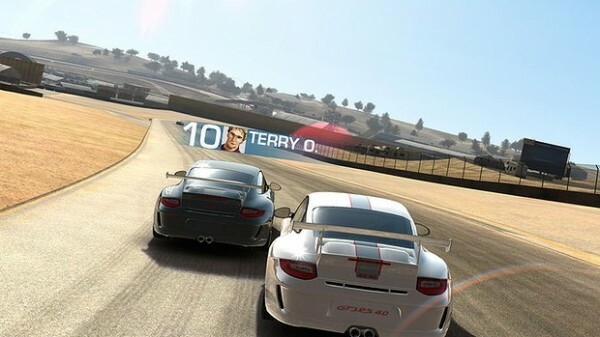 Real Racing 3 introduces a new way of racing than previous racing games: some people love it, others, like me, hate it. It introduces "console-grade graphics" to the game which is true - if they are referring to the Nintendo Wii. The game has a moderate amount of cars, 46 to be exact. All of the cars are already unlocked and are available for purchase as long as you have the cash. Since this is an EA game, it means there are micro-transactions in the game, so if you want to get ahead in the game, you can trade in your hard earned cash for virtual cash which you can then use to buy a virtual car or upgrades for said virtual car. Real Racing 3 features something called "Time Shifted Multiplayer" or TSM for short. 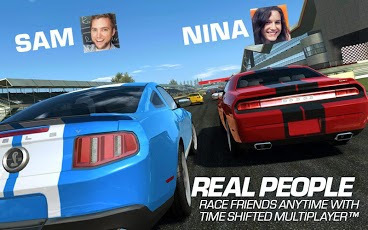 What this means is that instead of trying to beat a set AI time that is that same for ever single device and race, the game finds some random people who logged into Facebook, such as your Facebook friends, and puts you up against the times those friends got. The only problem with this system is the trophies part. Since all the times are retrieved from random people, they differ every time you play the game, so what annoys me is that Tim (the founder of [blank]'s Universe) gets a time of 1:34 in a race for example and gets 1st place, I could then beat his time with 1:29, but still only get 2nd because some random person has an even faster time than me. EA claims this adds to the "realism" of this game but personally is just annoys me. If EA wanted to make a "realistic" driving simulator, they should implement a more intelligent AI for the opponents. 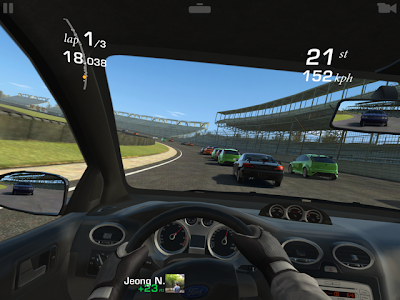 In a well developed racing simulator such as Gran Turismo 5 or Forza, your opponents try not to hit you or pin you against a wall, they also have an adaptive racing line that changes depending on where their opponents (you) are. I know this is a mobile game made for phones, but EA and Firemonkey could have done a better job with the AI. All your opponents will use the same racing line no matter where you are and have no regard to safety. So it is possible to be pinned against a wall while trying to overtake them. What makes this worse is that taking damage affects the performance of your car, and the damage is carried into other races. This means that your car is slowed down by damages caused in previous races while your opponents have spotless cars. There are many different types of races available in the game varying from Drag, Championship, Cups, and sprint, which all require a different skill sent and offers a variety of races to prevent the game from getting repetitive really quickly. The controls for the game are pretty well designed though. The game offers a lot of flexibility on how you want to play the game. There are options such as how much steering and breaking assists you would like, as well as if you would like auto-accelerate, tilt steering, touch steering, or using a virtual steering wheel. I personally found it hard to brake with the touch braking because it was either no brakes on, or they were on full lock, which doesn't help steer the car at all. I found my self only using brake assist and turning auto accelerate off just so it makes cornering easier, and gives me more control over the car. I would have like to have more control over the brakes but the touch screen is digital so its either on or off. The in game purchases work through coins and driver points. Driver points are rewarded after each race for position and whether or not you beat your friends. 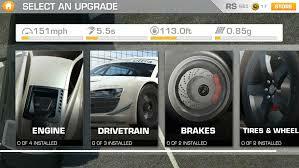 They can be used to purchase new cars to unlock more of the 900+ races available (although very repetitive), buy upgrades for your car, and what you will be doing most of the time, fixing your car. Coins are used to unlock more special items such as certain high performance cars such as the McLaren MP4-12C or high tier car upgrades. Driver Points are used for car repairs most of the time due to the AI in the game and the fact that i'm Asian so I can't drive. Physical damages to the car such as dented doors, hood, broken head lights, and windscreens, affect the cars speed, acceleration, and handling ( I don't see how a broken tail light affects top speed though). These things can be repaired instantly after the race restoring the car to like new condition, in exchange for drivers points of course. Things such as tires, engine oil, the engine itself, brakes, and suspension have a far greater affect on car performance but deteriorate at a "slower" pace. These parts only affect the cars performance if they waer down to a certain point. It takes more driver points to repair these parts and also prevents you from using the car for a set period of time while the repair is being done. Every week the game offers a showcase race for a specific car and offers a discounted price on the car. I find this nice as it introduces people to new cars in the game as well as giving a chance to get the car earlier on in the game as less money is needed to be saved up to buy it. There are many cars in the game and each series only allows a certain set of cars to be used, usually four. 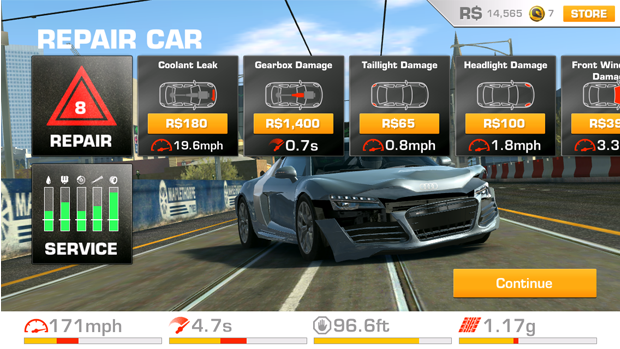 Some different events may let you use cars from previous events opening up multiple event per car in case you get stuck on a certain race on another stage. I found this game to be entertaining for the first few hours, but constantly having to wait to repair your car started to annoy me as well as how the lap times are determined with the "Time Shifted Racing". It was quite fun to drive around the track as well as having different types of races to make it slightly less repetitive. The game annoyed me after a few days of playing it mainly because I don't have a lot of patience to wait to repair my car, and that I couldn't get first in certain races because some random person somewhere in the world decided to get a super low lap time. 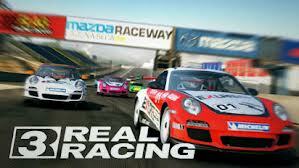 This is a great game for people who enjoy realistic racing games and have a lot of patience.